Where to Find Outstanding Fish in Lisbon! They say we should eat to live and not live to eat. But in Portugal, the line between the two becomes blurred. Eating fresh, whole, seasonal and locally sourced may be ultra-trendy these days, but in Portugal, good eating is a deeply ingrained part of lifestyle and culture. Shopping for groceries at my local market is a weekly thrill. Eggs straight from happy, free-range chicken. Aromatic oranges from the Algarve, bushels of hazelnuts from the Dão. Extra virgin olive oil from the Alentejo, just an hour outside of Lisbon. And the fun doesn’t stop when the market closes. When I’m extra lucky, my in-laws bring me just-picked, all-organic produce from the north of Portugal: onions bigger than softballs, foot-long zucchinis and bright, waxy lemons. I became a resident of Lisbon after having spent a few years living in the bustling heart of London. Immediately, one of the move’s biggest perks became clear: high-quality food is just so darn accessible here. (London, I love you, but the sad, defrosted, rip-off cod fillets that passed as ‘fresh food’ just don’t live up). It’s impossible to talk about fresh, locally sourced Portuguese eats without paying homage to the fruits of this country’ stunning coastline. To cut to the chase: Portugal’s fish is out of this world. I write this hand-over-heart! Rest assured there’s no bias on my end – after all, I pledge allegiance to the handful of different coastlines where I grew up. The beaches of Rio de Janeiro and San Juan were my childhood playground. The warm turquoise waters of the Bahamas have been a home of sorts, and the same goes for Chile’s eternal coastline and south Florida’s Atlantic beaches. And with all this time living in coastal cities and towns, I firmly believe that Portugal’s fish-based cuisine is truly special. It’s simply excellent. 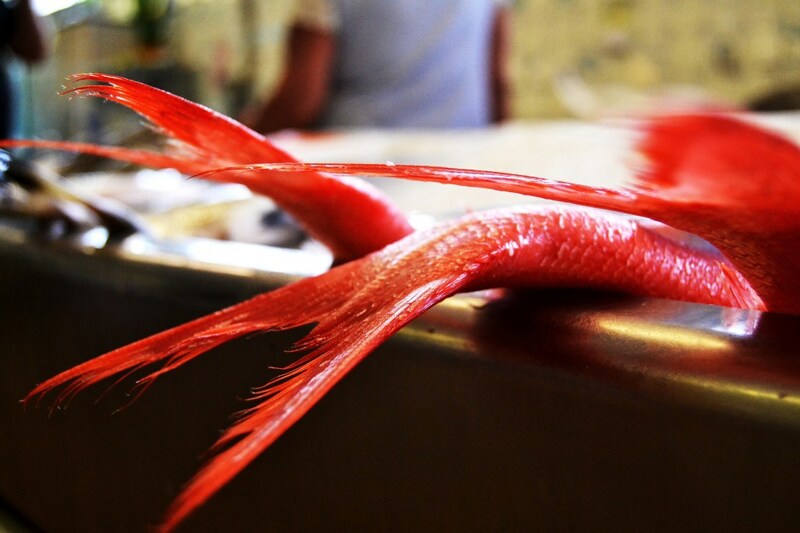 Here at Catavino, we’re crazy about Portuguese fish, and turns out we’re not the only ones. A few months ago, my younger brother and his buddy paid me a visit. Freddy and Jack were gallivanting in Europe for the summer, and after a nightmare hostel situation in Lithuania, spent five days getting to know Lisbon. I wasn’t sure what to expect out of two recent college grads crashing in my apartment, but I imagined it would involve significant partying, sleeping in late and eating carnivorously. Turns out Freddy and Jack got the partying about right, and I called it well by predicting their taste for Super Bock … but these two took me by surprise by getting totally into Portuguese fish. I don’t know what happened to my bacon-cheeseburger-loving brother, but by the time he left Lisbon, he’d vowed to go pescatarian. Inspired? Lest you find yourself strolling down the Baixa looking for food and fall into a tourist trap with a menu translated into seven languages, let us help you find some the very best fish possible. We can plan your life-changing gastronomic adventure to discover Portugal’s phenomenal fish-based cuisine! In the meantime, here are my suggestions for the best places to eat fish and seafood in Lisbon. This historic Baixa restaurant has a decades-long reputation for fine Lisbon dining. Its entrance is discreetly tucked away in a parking lot behind D. Maria II Theatre, making for a perfect dinner and theatre outing. The restaurant’s décor is elegant and understated, with beautifully carved woods and stained glass. Think old-school sophistication with attention to detail. Service is impeccable. Gambrinus has been around since 1937 and is known to have been a favorite of high-profile politicians and businessmen over the years. Dining at Gambrinus feels like an experiment in time travel. 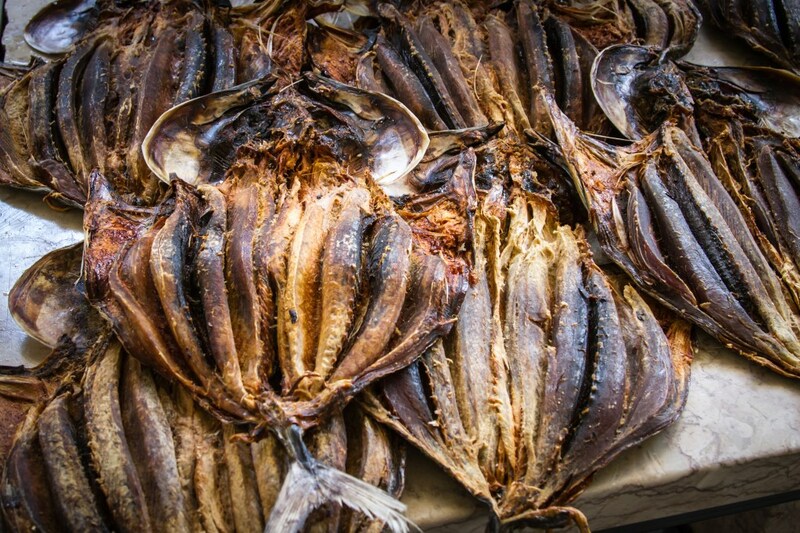 I can imagine generations of fish lovers before me feasting on oysters, smoked scabbard fish (peixe espada fumado), olive oil-basted mackerel (carapau) and shellfish soup, smoking indoors after their post-meal glass of Madeira wine. Gambrinus claims it’s THE spot for those who “appreciate fresh fish and shellfish or seek traditional Portuguese dishes.” Put on your fancy outfit and invite someone special to Gambrinus for a traditional treat in an emblematic Lisbon locale. Head high-up to the hilly neighborhood of Ajuda for a memorable meal at Mercado do Peixe, a traditional seafood restaurant set in a building reminiscent of an old warehouse. The restaurant has an authentic, rustic feel, with lovely wooden beams running across the high ceilings and traditional, blue and white decorative tiles. As its name suggests, Mercado do Peixe is best-known for its fresh fish and shellfish, but I was struck by the juicy-looking legs of presunto bolota, or ham from acorn-fed pigs, that hung from the ceilings. At Mercado do Peixe, fish and shellfish are served in their traditional guises. The waiters will graciously present the catches of the day and impart their recommendations. Last time I was there, I had tasty, grilled squid (lulas grelhadas) cooked to a golden-brown perfection and succulent tiger prawns. Order grilled sardines (sardinhas assadas) in-season for lick-your-lips-good summer fare. Portugal is well rooted in its fish-based cuisine, but who’s to say inspiration can’t come from across the world? Make your way to Principe Real for Peruvian-inspired cuisine that showcases Portugal’s freshest fish, served raw. Cevicheria is Brazilian-born Chef Kiko Martin’s newest venture, aimed at “showing new ways of eating fish”. The menu is concise. Start with the gazpacho made with Algarvian shrimp. You’ll find traditional ceviche (made from relatively bland, white fish) as well as creative variations on the dish, such as salmon, cod (bacalhau) and tuna ceviche. The house’s specialty cocktail is a delicious and mighty Peruvian lime-based drink made with grape brandy and bitters. It’s as much of a highlight as the food itself. No reservations are taken at this trendy Principe Real table, so order the pisco sour while you wait to be seated at this see-and-be-seen hotspot. Make an early appearance to minimize your wait time. We raved about Sea Me when this Bairro Alto restaurant opened its doors a couple of years ago, and we continue to be huge fans. Sea Me seeks to reinvent the traditional Portuguese peixaria, or fish restaurant, with its modern dining and Asian influences. Walk into Sea Me and you’ll find yourself perfectly placed by its sophisticated bar, where you may be tempted to order a glass of champagne while you wait for your dinner date. Sea Me does an excellent job in creating an upscale space that’s somehow so relaxed! Waiters buzz around this busy restaurant wearing cool, cleverly branded Sea Me t-shirts. The menu features traditional Portuguese seafood, such as freshly grilled fish simply served with salt and good olive oil, as well as classic favorites like clams served in olive oil, garlic and parsley sauce (ameijoas a bulhão pato). Look for modern twists like the tuna carpaccio with parmesan, lime vinaigrette and pepper. Lovers of Asian fusion will delight in Japanese-influenced dishes as well as in more mainstream sushi and sashimi options. Look forward to experimenting with an exciting wine list! I’ve heard a local or two moan about the lack of International food in Lisbon, but with each passing day there’s less to lament! Authentic restaurants inspired by other countries’ cuisines are becoming more and more common in Lisbon, and Tomo is an excellent example. Make your way to Algés for a traditional Japanese restaurant tucked away in a quiet neighbourhood in the outskirts of central Lisbon. This low-key restaurant’s got a menu that brilliantly showcases the quality of Portugal’s fish. You’ll find sushi and sashimi options a-la-carte, tempura shellfish and vegetables and soba noodle soups. It’s not just about the main course at Tomo. I was amazed by some of the appetizers, with the vinegar-cured octopus and miso-glazed eggplant standing out. If you have room for dessert, go for green-tea or sesame-flavored ice cream. This family-owned restaurant overlooks the wild seaside cliffs of Boca do Inferno, where waves crash violently and beautifully into jagged ocean rocks. Mar do Inferno is my go-to for fish in the Lisbon area. My meals here have only ever been exceptional. With extremely fair prices, Mar do Inferno is a place you can enjoy liberally! The food here is, in my view, Portuguese cooking at its best: simple dishes with few, but top quality, ingredients that speak for themselves. No need for too much sauce or batter. These memorable meals will let you appreciate the ingredients in your dish: the salinity of white fish, the aromatics of olive oil, the green spice of parsley. The seafood platter for two (travessa do mar) is a fun way to get a sampling of different fish and shellfish, and the pan-seared scallops are my personal favorite. When it comes to wine at Mar do Inferno, I’m a sucker for Tres Bagos Sauvignon Blanc, which pairs nicely with essentially anything you can order here! This local hotspot is packed around the clock, so don’t forget to make a reservation. I happen to have spotted celebrity Chef José Avillez at Mar do Inferno once or twice… On a warm sunny day, ask for a table in the tarped area with a view of the water. Is it possible I’ve saved the best for last? A meal at Porto Santa Maria will be memorable. It’s perfect for special occasions, although I highly suggest treating yourself to a meal here in the absence of one! Before you even get to the food, the views over the Atlantic Ocean will have made the experience unforgettable. Porto Santa Maria is located on the steep ocean-side cliffs near Guincho beach, between Cascais and Sintra. It boasted one Michelin star for 25 years, which it lost in 2008 for reasons unknown to me (Michelin stars certainly don’t say it all, and I rarely give much credence to them!). Porto Santa Maria is elegant, fine dining in an understated way. As you walk in this spacious, well-lit restaurant, fresh fish purchased from local fisherman are displayed before you against a stunning backdrop with a seemingly infinite view over the Atlantic. Book a table near the window, and get there around sunset for tear-jerkingly beautiful skies of orange, pink and purple. Order a glass of espumante and start with king crab or grilled prawns, served family-style. Ask for a gilthead bream (dourada) or snook (robalo) baked in salt for an oven-baked fish cooked whole under a layer of sea salt. Seeing your server carve the fish out from under the hardened salt is spectacular. The fish will be moist and cooked to perfection, and surprisingly not particularly salty. The cherry on top: this restaurant has a 42-page wine list that will make any wine lover shake at the knees. In the end, you can’t go wrong with Portuguese fish. What I’ve offered is some of my favorites, but if you’re keen for a private tour based on your specific palate, drop us a line and let us craft a customized tour specifically for you!